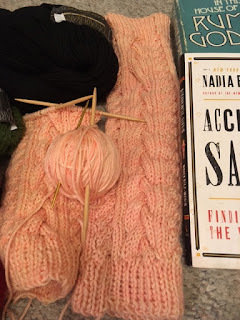 Thanks to Ginny at the beautiful blog Small Things, each week, we are able to enjoy the Yarn Along, a link up of books and knitting. How amazing is that? Two of the most wonderful things in the world and the most wonderful things to dream about! 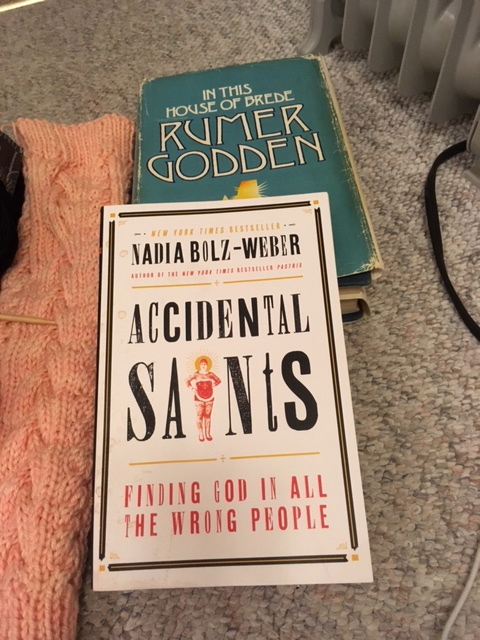 I'm not sure what I like more - finding new books and dreaming about reading or finding new knitting patterns and dreaming about choosing yarn. This week was a good one for me. Since school finished really late this year, that means that we go back late, too. Hooray! I know, it makes the lead up to Christmas really busy but it means that we get a week after New Year before we go back. I LOVE that! Dh's family lives about 3 hours north of us and they live in an area that gets lots of snow. That can lead to problems during winter visits and we can't risk getting stuck up north. We very rarely get up north during the winter, especially now that the family is so busy on weekends with skating lessons and church activities. This week and this visit has been heavenly. 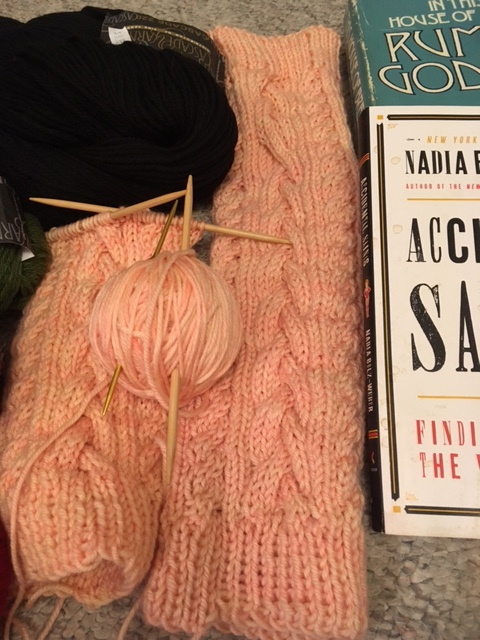 One great part of the trip is that I get to do some knitting in the car. I had started another pair of fingerless gloves but I have to be honest, working them on the 2.5 mm needles is not that much fun. I love the close stitches but I am so afraid of dropping them and it doesn't travel well. I did some reviewing of my "to-do" list and decided to break out an old pattern that I used a lot last year, the Gap Inspired Leg Warmers. I made Pk three pairs last winter and several of her skating friends had hinted at pairs, too. I had some nice yarn left from the wrap I made for Christmas so I decided that would be the colour of the first pair. I was also really excited because the town in which Dh's family lives has a really nice yarn store that is exactly what I look for - really nice yarns that aren't too frilly or fancy, just nice basic wool and other fibres in nice colours and while not cheap by any stretch, not insanely expensive, either. I love some of the fancy hand-dyed colourways in some exotic yarns but sadly, most are far out of my price range. At the visit to the yarn store, I got enough to make red leg warmers, black legwarmers (the colours that Pk wants to match her skating clothes) and a really nice green to make a green and black hat (as requested by my b.i.l.) I could have gone crazy (they had some Cascade Eco in some lovely colours and I really like using that) but I controlled myself. We should be coming back at March Break and between now and then, I am supposed to get a baby blanket finished so there's no point in going crazy. Reading has also been refreshing as I finished several of the books that I have been dragging through and am now onto some fresh reading. A book that I loved years ago is one that I am rereading - Rumor Godden's In This House of Brede. It's hard to describe but it's about an order of nuns and the complex relationships in the community. It's a nice change. I am also reading Accidental Saints by Nadia Bolz-Weber, which I LOVE. She would not be to everyone's tastes - she's a Lutheran pastor who is covered with tattoos, has a foul mouth and a history of living life rough and she is an Enneagram 8. On the other hand, she is the perfect mix of sarcastic, funny and with rock-solid theology and a perspective that is often very fresh and VERY wise. She is so easy to read but I know that she wouldn't be for everyone. If you are easily shocked or you are uber-conservative, she isn't for you but I am really enjoying her. I liked her previous book, Pastrix, but I like this one better. I can't wait to see what everyone else is reading and stitching!